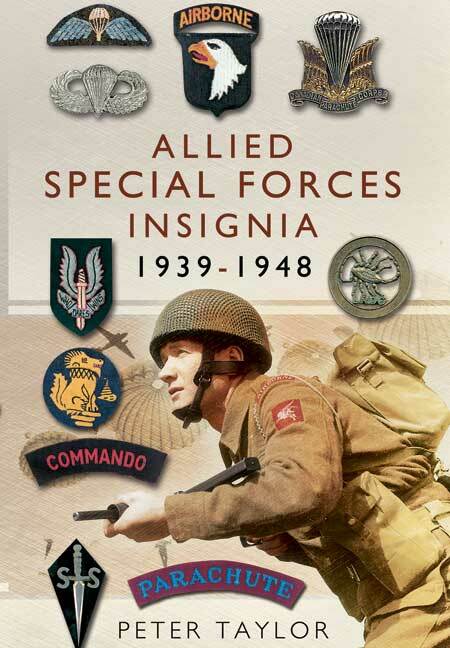 You'll be £14.99 closer to your next £10.00 credit when you purchase Allied Special Forces Insignia. What's this? From these uncertain beginnings was born a plethora of Allied Special Force units. Inevitably some are household names but others are little known, having had brief and covert existences in far flung parts of the world.rnrnAll, however, had distinctive identities and their proudly worn insignia represent a fascinating and often elusive challenge for militaria collectors. This is due, not just to the scarcity of items in many cases, but to the mystery of their origin; a number of these units were established on an ad hoc and spontaneous basis. Peter Taylor's aim in compiling Allied Special Forces Insignia 1939-1948 is to fill a gap in the growing bibliography of militaria collecting. At the same time, Brigadier Bryan Watkins' introduction sets in context the growth and development of Allied Special Forces during the global conflict 1939-45. Lavishly illustrated, this work will prove an essential reference work and companion guide for the expert collector and all interested in military history. It is difficult to praise the author sufficiently as his work has yielded an outstanding reference manuscript. I found this book extremely interesting as it presents the insignia of all Special Forces associated with the Allied cause. It contains data on both the popular ones and those which are little known about. The numerous photographs enable the identification of badges and this work is undoubtedly the book to have on this subject. This is a fascinating book, with great photos and illustrations, along with such things as notices to soldiers, exhortations on what it means to be in Special Forces and other ephemera. The list of Special Forces really is exhaustive in this book, and includes some that I had never heard of, along with the more familiar units. Each entry contains a potted history of the formation alongside photographs and illustrations of the insignia and people, and is a very useful tool in learning about these formations. An excellent book that will be of value and interest to anyone with any sort of interest in these forces. Which, from posts on this site, appears to be many. A superb catalogue detailing the insignia of those wartime units, particularly the British ones, which may be labelled as Special Forces; including the Parachute and Glider Pilot Regiments, Commandos, Special Air Service, and the various raiding forces which operated in Europe and the Far East. The Special Operations Executive, Polish Parachute Brigade, and the US Airborne and Rangers are also discussed. Clear and original colour examples of practically every conceivable insignia type, worn at any time during the war by any branch of the above formations is included, together with numerous carefully selected wartime photographs to show how they were properly applied to uniforms. A first class reference guide. Lavishly illustrated, this work proves an essential reference work and companion guide.